Is the media killing our planet? Professor Toby Miller delivers his inaugural lecture which examined the environmental damage caused by the media and entertainment industries. Kiefer Sutherland's hit series '24' was the first prime-time carbon-neutral network TV drama in US history, the Fox News Corporation may be the greenest media organisation in the world and Leonardo DiCaprio may have (indirectly) caused more damage to planet earth than any actor in the history of Hollywood. These were just some of the intriguing facts revealed by City University London's new Professor of Cultural Industries, Toby Miller, during his inaugural lecture last night. 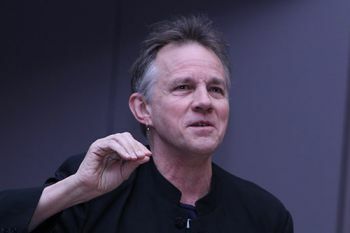 In an hour long speech, entitled Greening the Media, to students, academics, collaborators and friends, Professor Miller painted a truly frightening picture of the level of harm that the West's hunger for media and its associated technology is having on some of world's poorest people and the planet's natural resources. In his recent book with Richard Maxwell, also called Greening the Media, Professor Miller tells a tale of e-waste in the West that is 'truly astonishing' with 'five hundred million personal computers discarded in the United States between 1997 and 2007 which contained 6.32 billion pounds of plastics.' Much of this waste ends up in landfills in the developing world. Exposure to some of the toxins in these products has had a detrimental effect on the populations that have to deal with it. Professor Miller showed a picture of a small child in Guiyu, China, entangled in discarded telephone cords, and told the audience that as a result of exposure to the waste dumped in this once rural district, the population had dangerous lead poisoning. As for Leonardo DiCaprio, Professor Miller discussed the damage that his films Titanic and The Beach had on the area in which they were and filmed, both to the local landscape, for example the Thai islands that had to be dramatically altered as they didn't look enough like Thai islands, and the environment. A prolific author who has taught around the world Professor Miller's teaching and research covers media, sport, labour, gender, race, citizenship, politics, and cultural policy, he is the author and editor of over 30 volumes, and has published essays in well over 100 journals and books. His current research covers the success of Hollywood overseas, the links between culture and citizenship, and electronic waste.